Who said good medicine must have a bitter taste? That is so wrong! CBD Mango Haze is an incredibly CBD-rich medical variety with a delicious flavor of spices, mango, pineapple and pepper. The plants have an "open" structure; means, the light can reach down to the lower branches, allowing for higher yields. Stunningly high CBD level of up to 10%. Whoever coined the saying "good medicine must have a bitter taste" was utterly mistaken! 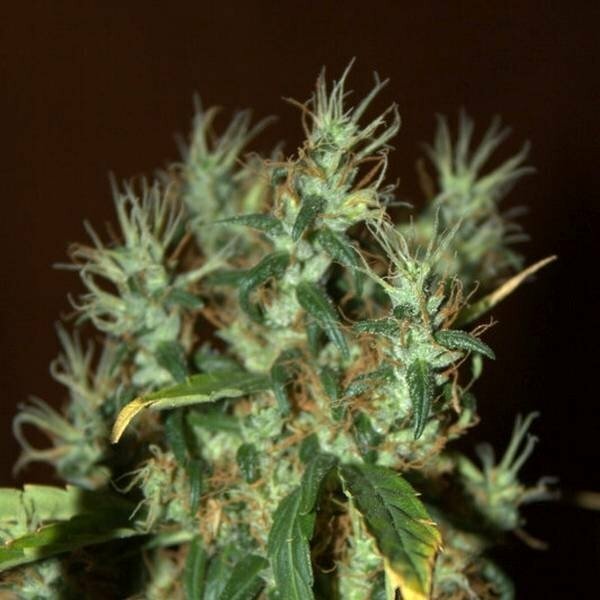 CBD Mango Haze is a medically highly valuable strain, but boasts with a delicious flavor of spices, mango, pineapple and pepper, making her one of the most pleasant tasting remedy. With this Sativa dominant (80%) green medicine, the CBD Crew has pushed a strain onto the market that exceeds the 1:1 THC:CBD ratio - CBD Mango Haze delivers buds with a THC level of only 6-8%, but a whopping 8-10% of CBD. This stunningly high CBD and low THC level means the heady effects as normally induced by THC-rich strains is much less pronounced whereas the body-related effects are much more distinct. The lanky plants grow in an "open" structure, which means the light can reach down to the lower branches, increasing the overall yield. Although, when grown in a ScrOG setup, it is recommended to cut out the lower branches early in the flowering stage to encourage formation of larger central flower umbels. Under a 600W lamp it is possible to harvest 450-550g/m² after 8-11 weeks of flowering, depending on the phenotype.